Mexican drug traffickers pose the biggest organised crime threat to the US, a justice department report says. Most of the cocaine available in the US is smuggled via the US-Mexican border, while Mexican drug traffickers control most of the US drug market. Mexican smugglers are also working increasingly with US-based gangs. But the report says factors including increased border security and inter-cartel violence in Mexico have hit the cocaine supply in some areas. "Mexican drug trafficking organisations represent the greatest organised crime threat to the United States," says the annual National Drug Threat Assessment, drawn up by the justice department's National Drug Intelligence Center. "The influence of Mexican drug trafficking organisations over domestic drug trafficking is unrivalled," the report says. Mexican gangs control distribution in most US cities and are gaining strength in areas they do not yet control, the study finds. 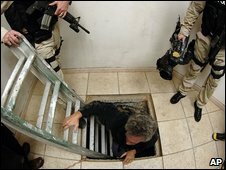 The Mexican smugglers' influence is down to a number of factors, including their use of a variety of trafficking routes and transportation methods and growing links with US-based crime organisations, including street and prison gangs. Mexican gangs maintain cross-border communication centres near the US border to co-ordinate smuggling, using satellite technology, VOIP, and encrypted messages. The report estimates that Mexican and Colombian drug traffickers make and launder between $18bn (£12bn) and $39bn (£26bn) in wholesale drug profits annually. The report says that shortages of cocaine were detected in 2007, although availability crept back up in some cities in 2008. Among the possible reasons for the decline in cocaine supplies are successful coca eradication in the producing countries and large seizures, as well as expanded cocaine markets in Europe. The report also points to increased operations against the cartels by the Mexican authorities, and growing fighting among the gangs for control of smuggling routes. Asian traffickers are producing increased amounts of MDMA (ecstasy) in large clandestine laboratories in Canada. Earlier this month, the US government released the first part of a $400m scheme to assist Mexico's efforts to take on the drugs trade. In Mexico, more than 5,000 have been killed this year in drug-related violence. The Mexican government has deployed some 40,000 troops and police since December 2006 against the cartels.